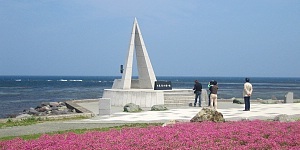 Cape Soya (宗谷岬, Sōyamisaki) is the northernmost point of Hokkaido. It is located in Wakkanai, the northernmost city of Japan. The area experiences one of the nation's lowest average temperatures, is sparsely populated, and has a typical Hokkaido laid-back character. The coastal landscape along the shores around Cape Soya makes for spectacular scenery. During winter, the seas are rough and the winds are harsh. Drift ice (ryuhyo) can sometimes be observed from the cape around February. View from the hills above Cape Soya, along the \"White Road\"
Today is the first walking day of the 2013 We Love Japan Tour. This morning, I set off from the Sun Hotel Wakkanai where I am staying, to Cape Soya. From there I walked 7km along the coast down to Soya Park (Soya Koen). Yesterday when I checked into the hotel, I found a little origami bird in my room - nice welcome gift! We set off from Cape soya at 9h30 and walked along the coast to the village of Soyamura and Soya Park. We were greeted by around 15 people, including the Wakkanai mascot. Our little group set off from the Cape Soya monument and walked along the road, passing a couple of fishing villages. Even though we were lucky with the weather and enjoyed a very nice sunny day (instead of a typhoon we feared at the beginning), it was extremely windy. Since we are at the very north of Japan, just opposite Russia, there is always a cold sea wind blowing and the sea is very rough. After walking against the wind a couple of minutes I understood how important is it for the people living there to build proper protections against the sea! After about two hours we got to Soya Park and from there we set off to walk along the "Shiro Michi" (literally "White road"), a beautiful path stretching along top of the hills that is easily accessible by car or foot from Soya Park. Its name comes from the fact that recycled seashells were used to cover it, giving it its stunningly pure white colour. The views from the "White road" were absolutely spectacular: rolling hills, beautiful bright green grassy expanses with the occasional grazing deer or the Cape Soya black cows whose delicious - and sadly very expensive meat - is praised all around this part of the country. After the white road walk we stopped for lunch at a very nice restaurant on the top of the hill just behind Cape soya where we had delicious ramen noodles as well as a local specialty of seashells. In the afternoon we visited the Ohnuma bird sanctuary near Wakkanai where we were able to spot many different species of ducks, birds and swans. Set on the shore of Lake Ohnuma, it boasts great views of the lake as well as Rishiri Island far away in the distance. We start the 2013 We Love Japan Tour with a visit to the Cape Soya, followed by a 7 kilometer walk along the coast from the cape to the village center of Soya Village. Terrain Today's journey is along a coastal road with a sidewalk. The ground is level for most of the walk. Access Limited express trains connect Sapporo Station and Wakkanai Station (5 hours, 10,000 yen one way, 2 departures per day) via Asahikawa (3.5 hours, 8000 yen). ANA operates flights to Wakkanai Airport from Sapporo's New Chitose Airport and Tokyo's Haneda Airport. To get to Cape Soya, take a bus from the bus terminal in front of Wakkanai Station and get off at Soyamisaki (宗谷岬) bus stop (50 minutes, 1350 yen one way). Buses are infrequent and depart at 5:45, 8:38, 11:25 and 13:20. The 8:38 departure arrives at the cape at 9:28 just in time for today's walk. From Soya Village, buses making the return trip to the station can be boarded at the Soya (宗谷) bus stop. Departures are at 10:13, 12:50, 14:44 and 17:56. Lodgings Accommodation can be found in central Wakkanai City. The deadline for answering the quiz question for day 1 has passed. To which of Japan's 47 prefectures belongs the country's southernmost island? Japan's southernmost island, Okinotorishima, belongs to Tokyo. Japan's southernmost inhabited island, Haterumajima, belongs to Okinawa.